Lachlan Mclean is a graduate from the Victorian College of the Arts Bachelor of Music Improvisation degree. He currently plays with The Meltdown, San Lazaro, The Raah Project. 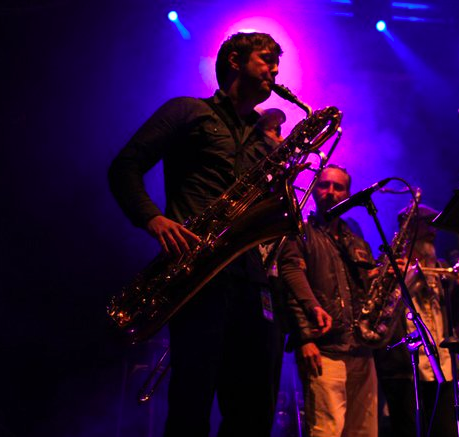 He has worked as a freelance saxophonist for bands such as The Hoodangers, Kate Ceberano and Tim Rogers. Having toured extensively throughout Australia, Lachlan has also performed at festivals and clubs in the USA, Denmark, Norway, Scotland, Iceland and Spain. Lachlan has performed and studied many styles of music including Jazz, Latin, Salsa, flamenco, Choro, Soul, Funk and Hip Hop. This is reflected in Lachlan’s involvement in many significant music festivals, including: WOMAD Adelaide (2008), Wangaratta Festival of Jazz (04,05,06), Fest Napuan Vanuatu (2008), Woodford Folk Festival (06,08,09) Byron Bay Blues and roots Festival (2008-2014), 2011 Hauegusund Festival (Norway). The Collaboration with Simon Burke has seen the formation of The Meltdown. This has enabled Lachlan to further develop his management skills, taking over the role for the band. As well as arranging Simons songs for the band, the two of them have composed a number of co-writes including “Sweet Water”; the b side of “Better Days”. Since February 2015, “Sweet Water” has been viewed 37,889 times on youtube.